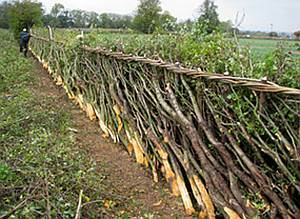 Hedge-cutting or hedge laying is an ancient art which creates a stock proof hedge from living thorn and other hedgerow bushes. Hedges can be rejuvenated using this method and have lasted hundreds of years providing a natural boundary between fields and also act as a wonderful environment for bird and insect species. The countryside would be the poorer without the work of the hedge-cutter and the willingness of farmers and landowners to bear the costs. An additional benefit to the environment is in the woodlands where hazel is coppiced to produce stakes and binders that are used in staking and binding the cut or layered hedge. There are many styles of cutting throughout the country but here in Leicestershire and Rutland we use the Midland Style which was developed to keep in livestock especially cattle and sheep.